A ferry arrived that started at the Akosombo Dam in the south and ended at the village of Yeji 30-36 hours later. I heard it was comfortable and possible to maybe get an AC cabin. A good way to transport, not sure a good way to see the country. 12 people arrived in Yeji while I was there and we all went to Tamale together. I think every day around 7-8 one to three boats leaves for Makongo. Anyway, I say it, I have to respect this bunch, they are the first group of people traveling in West Africa where a person could remove the word Volunteer and say they are backpackers. I was trying to get a shower and it looks as though none of the groups tried, they just made camp styled their way from the Dam to Tamale. The maybe sad part, is they saw very little of Ghana, and mostly just survived the difficult transportation. It would take good prior knowledge of the city to enjoy the play properly. If I had known now, what I presently know, I would still be there. Yeji feels like a border town, as there are massive numbers of bicycles, showers, motorbikes and every type of wholesale West African type, we-buy-this product possible to purchase in the very large market. There are so many products the government will probably soon opens this huge concrete market structure just to get their hands in the pockets of the venders. 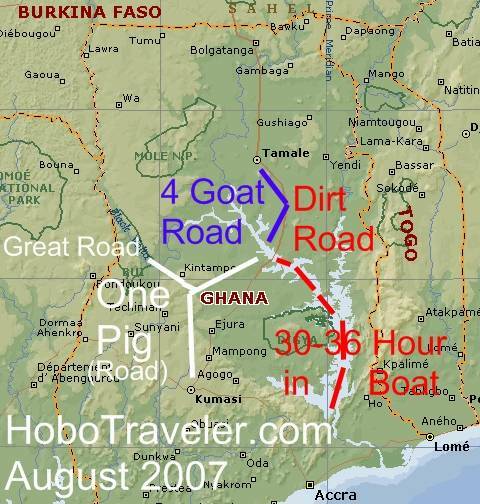 I took a great road for Kumasi to Yeji, and then the road from Makongo on Lake Volta to Tamale was a wide dirt road. Makongo seem to have zero hotels, so I needed to travel to Tamale. The road labeled one pig road was great, the road labeled four goats was ok, and actually quite and easy trip considering the road was the red gravel. It looked ready to pave in the next couple of years, as it was very wide. The taxi hit one pig on the road, and our large 20 passenger Tro Tro killed four goats, as he did not slow down twice properly to allow the goats to move. The pig was just a stupid pig that ran at the last moment in front of the taxi. So, where am I now, I am with three British Girls and one Dutch girl in a Whorehouse in the middle of Tamale.